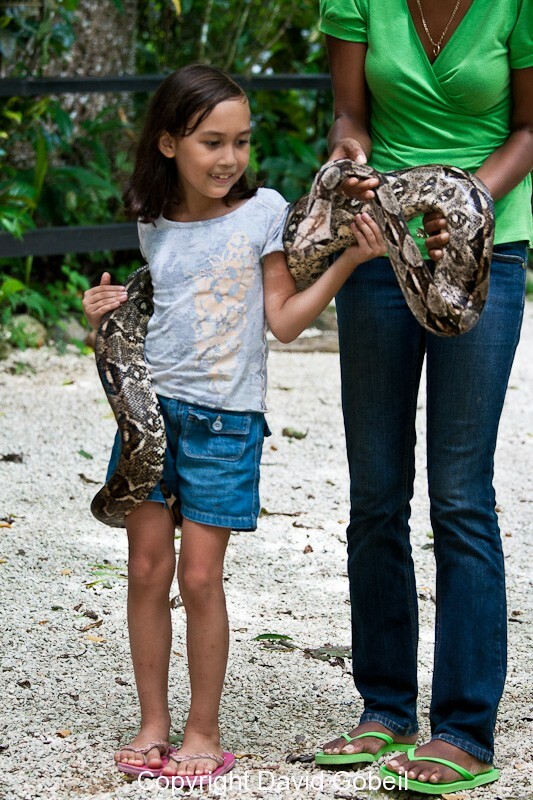 Often referred to as “The Best Little Zoo In The World”, The Belize Zoo is one of the most visited tourist attractions in the country, with many locals visiting as well. The zoo is basically set into the rainforest, with 29 acres of simply constructed cages and pens for all of the 145 animals, (over 45 species) which are indigenous to Belize. Most of the animals are rescued after being injured, abandoned, orphaned, or otherwise in need of re-rehabilitation. The main attraction at the zoo is a resident jaguar named “Junior Buddy” where visitors can actually have their foreheads licked by this huge, fierce looking cat! Another popular resident is Bosch or “Lucky Boy” a recently rescued Black Jaguar which is being rehabilitated by the zoo’s talented and gifted staff. Other notable animals are Spider Monkeys, who usually put on quite a show swinging through the trees, a Harpy Eagle, Scarlet Macaws, Toucan’s and Belize’s national animal, the Tapir. I’ve personally visited the zoo many times over the years, and it’s always a delightful and enriching experience for me to get so up close and personal with so many of Belize’s indigenous animals. The Belize Zoo is located approximately 29 miles west of Belize City on the George Price highway. Contact them at 822-8000 or email them at info@belizezoo.org. Junior Buddy was the gorgeous jaguar who presently sat purring above us, only a wire cage keeping him from joining us in the box we sat in. We were at the Belize Zoo, considered the “best little zoo” in the whole world. Junior was just one of the many animals we had seen during our behind the scenes visit with founder and all-around amazing Zoo director Sharon Matola. But back to the foreheads (hair pulled back): I went first, one trembling hand pulling back my hair, and then slowly, I put my forehead against the cage right next to his big, furry face. Through the cage the roughest yet gentlest tongue began LICKING MY FOREHEAD!! It was the most excruciating and exhilarating experience – here I was, in a zoo with jungle-like environment, and mere threaded metal holding back hundreds of pounds of big cat with a 900lb crushing power per inch of tooth, and he was licking my forehead like any old kitty. My companions were thrilled and they too eagerly offered up their foreheads. One of them was so delicious Junior drooled all over her. I have to admit I was just a smidge jealous – I wanted Junior to drool over me. But there you go, either in the zoo or jungle, even a jaguar didn’t think I was drool-worthy; sigh. Junior is one of the most well-known jaguars throughout Belize, and is a perfect example of enrichment training. Junior Buddy was born at the zoo to a problematic sheep-killing jaguar, and his mother rejected him a mere two days after being born. Jaguars are highly intelligent creatures, and the zoo staff, especially Sharon, have found creative ways to keep his mind agile. One of the fun tricks he has learned is somersaulting. Yes, big ole kitty tumbling just doesn’t seem to be right, yet there he was, doing tricks for us (there is video evidence below!). Treats are in order after such impressive tricks, (he also loves applause, but treats are so much nicer) and we can’t help but feel awe when a jaguar gently takes a chicken gizzard or neck from our hands after it’s shown off its impressive skills.